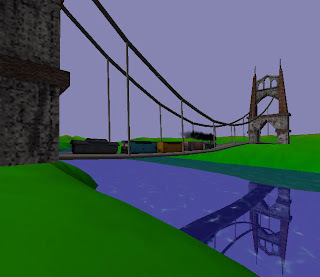 "Bridge Construction Set" is a small shareware, meaning you can try it for free but if you want to unlock all its features, you have to pay a small fee of about $20 or 15 euros. It works under Windows, Mac OS X and Linux. Despite the fact it is all in 3D, it doesn't require a high-end computer. It is the perfect tool to help students apply practically their knowledge of structures, stability and constraint. They will take advantage of their knowledge of the following concepts: symmetry, choice of material, types of bridge, center of gravity, triangulation, structural efficiency and constraint. At first, a budget is given to the student. This will encourage him or her to judiciously manage the resources available. As the game goes on, new materials will become available, iron, steel, cables, etc. 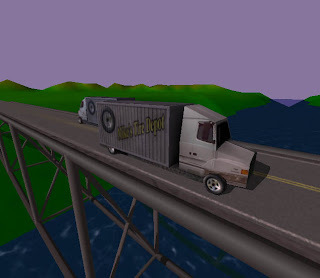 Students can use their creativity and at any time during the game, they can simulate the passing of cars or other vehicles on their bridge. It is also possible to visualize the constraint on each beam or each cable. The program presents the bridge in 3D and it is possible to change the viewing angle as well as zooming in or zooming out. 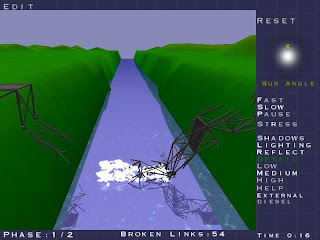 Many features will help adding to the realism of the situation. It is possible to change the angle of the sun, meaning you can view your bridge at any time during the day or night. It is also possible to add reflection and shadows. Even if it is always fun to have a bridge that will resist to the passing of cars, trucks and trains, it is also fun to see it collapse like a castle made of playing cards. This is when the learning experience really starts. The student has to troubleshoot and modify the bridge to make it withstands the weight of vehicles. The possibility of retrying is not available for real engineers, but it is great for students to have access to it. When using the program for the first time, it is highly recommended to use the tutorial to have a better understanding of all the features. By paying to upgrade to the full version, you will also get more levels of difficulty, new building materials and new vehicles, you will be able to create your own maps and you will be able to enhance the realism by adding decoration and other 3D objects. November 1, 2011 at 11:15 p.m.